Fracking operations in the Bakken region in North Dakota. 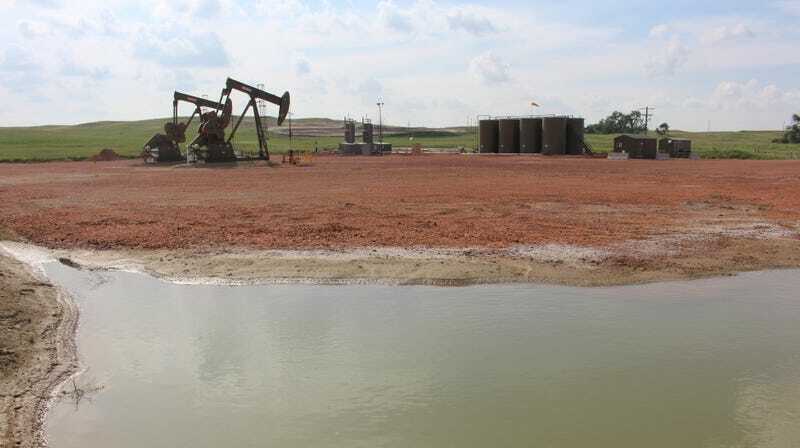 Public concern over hydraulic fracturing (better known as fracking) has often focused on the potential for this extractive process to pollute waterways. Well, a new study reminds us that fracking is messing with our water in more ways than one. Published in Science Advances Wednesday, this study found that more and more water has been used for fracking since 2011, when the United States began to really ramp up oil and gas extraction via this method. Fracking involves drilling into the ground and using large amounts of water and chemicals to stimulate the flow of oil and gas from rocks like shale. Often times, operators are using groundwater, surface water, or some type of freshwater to do this—water that people could use for drinking, said lead study author Andrew Kondash, a PhD candidate at Duke University’s School of Earth and Ocean Science. To understand how water use for fracking has changed as the industry has expanded in the US, the authors pulled data on water use and production volumes for fracking at over 12,000 wells from a range of sources, including state databases and the public FracFocus Chemical Disclosure Registry. While the water use per well increased in each of the six production regions examined, the spike varied depending on where in the researchers looked. In the Permian Basin, which sits on Texas and New Mexico, water use per well increased by 770 percent from 2011 to 2016. The Marcellus region near Pennsylvania and West Virginia, on the other hand, only saw just a 20 percent jump. Given the number of resources the study includes, the paper does acknowledge the potential for bias and error. And while a pattern clearly showed an increase in water usage across the board, the team has yet to fully comprehend why or how. Water usage in fracking has increased, and many of our shale resources happen to be in areas already dealing with water stress. “Part of it can just be attributed to the geology of the area,” Kondash told Earther. Where the shale is drier (in, say, the Marcellus region), less water is needed to fracture a rock formation. The other piece of the puzzle is the lengths of newer wells. In the five-year study period, the median length of horizontal wells used for fracking also increased, though those increases didn’t match up perfectly with the water usage data. Still, the longer the well, the more water necessary to reach and fracture the rock. Different companies also have different techniques, and some could be trying out a more water-intensive form of fracking, Kondash said. On a national scale, the impact of fracking on water use doesn’t stand out much when compared to other industrial water uses, like watering golf courses or agricultural crops, for example. However, the impacts of increased water use can be felt more locally, especially as climate change worsens droughts in the West and makes water an even hotter commodity. “[This paper] provides a number of both challenges and opportunities,” Kondash told Earther. On the opportunity side, the study points to another reason to look at alternative energy sources or, at the very least, alternative water sources. Some wells use recycled wastewater instead of freshwater, but a lot of energy is needed to filter this water, which the study found is also being produced in higher quantities. Still, the study’s authors urge legislators to look to alternative water sources like recycled wastewater, or even brackish water instead of freshwater. Kondash hopes legislators “wake up” to what’s happening within the fracking industry. This water might be a small drop in the greater bucket of water usage in the U.S., but this study could help dictate where our leaders take the practice next.